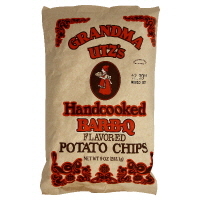 The Grandma Utz range of (two) Chips varieties is clearly an homage to past times. It is doubtful that the bag has been re-designed for a a long period. We appreciate this, but do not agree with the approach. Utz must be very confident of their position in the marketplace because all of their own brand bag designs are very dated and border on the inappropriate for a modern market. They almost relate a 'Can't be bothered to modernise' sort of attitude to the customer, which cannot be a good thing. These Chips had a particularly oily crunch to them. They cracked and creaked as they were bitten into. The crunch was sustained, but the Chips seemed to slide about before they eventually became potato mash. These Chips seemed a little more thickly cut than the regular Chips in Utz's extensive portfolio of Barbecue Chips. There was potato skin on some edges and they were a richer, more dark yellow color that was added to by the seasoning powders. A Nose Plunge Test revealed a smoky Barbecue aroma. The oily and salty potato combined with this sort of imagery to create the flavor. The Barbecue flavoring was certainly not as sweet as some of the others in Utz's range (a third of their Chips are Barbecue related). The key to the flavor is the lard they are cooked in. It is an acquired, traditional additive to the flavoring combination that once tried immediately promotes visions of past times. These are what Potato Chips used to taste like.